We are in the final stages of post-production now. Within a couple weeks the film will be off to the DVD duplication house! Thanks to everyone for your support, and for understanding our delay in releasing this picture. We had originally planned on a Spring 2017 release, but over the Summer we had the opportunity to interview two of Frank’s nephews. The material and information they were able to provide proved to be invaluable, and definitely added to the film. The final result is an incredible, feature length, film (102 minutes!). We really think you’ll enjoy it. The DVD will be a 2 disc set, with both a standard DVD and an HD digital copy included. There will also be a full colour booklet with lots of rare photos and a mini poster insert. Along with the DVD release, we will be releasing the Original Soundtrack Recording via all major online retailers. The soundtrack features a gorgeous Score composed by Ian Ring & a fantastic original song by The MacQueens. You’ll want to check this out! We are still conducting interviews for the film, and will be throughout the Summer, possibly into the Fall. I just wanted to take a moment to thank our interviewees for sharing their memories and stories with us. Today I had a great visit with Ken & Glen, a pair of brothers who grew up on the border of Bridgeport & Kitchener in the 50s and 60s. It’s been a wonderful experience talking to you all, and it’s great to see people’s faces light up as they reminisce about Bridgeport and The General. We’ve begun the second phase of shooting for the film! Today we were on location at Bridgeport Public School talking to students about what they know (or don’t know) about The General. Did you know that his portrait hangs in the front lobby of the school? We would like to extend a huge thank you to Stephen Sherlock and Donna Zink for their help running today’s shoot smoothly. And a HUGE thank you to Alexia, Alea, Lily, Austin, Daniella, Elyse, Del, Olivia, Alexa, and Charis for doing a fantastic job today! Filmmaker Rob Ring will share the story of the Bridgeport General in a new Documentary. A local filmmaker is hoping to uncover the truth about a local personality, who some say had a bathtub full of pennies in his home. “I doubt that very much, but I do have reason to believe that he kept his money in his mitten,” said Rob Ring, who is embarking on a documentary about the Bridgeport General. The General, who worked as a Kitchener school crossing guard at Lancaster and Bridge Streets for more than 20 years, is the subject of many tales. “He’s a bit of an enigma and it’s interesting because a lot of people don’t know his early life — his history,” Ring said, adding that conflicting reports about his history is part of what motivated him to embark on the project. Ring said he wore layers of sweaters underneath a coat that was fastened with safety pins. His stop sign was handmade. The General was fired from his job after refusing to use the city-approved stop sign and conform to a dress code. But he had such an appeal with the children, they convinced city council to let him come back. They went so far as to protest, and refused to cross using a new city-approved crossing guard. “As much as it is a story about Frank, it’s also a story about the Bridgeport community too and the way they took care of him and looked out for him,” said Ring. Before working as a crossing guard, Frank Groff, born in 1914, was a caddy at the Grand River Golf Club, and worked at McBrine Baggage company. Ring’s interest in the General goes back “quite a ways.” In the basement of his family home hung a poster of Groff. That poster eventually made it into Ring’s possession and he realized he didn’t know the story behind it. Ring is hoping some of that mystery is solved by two of Groff’s remaining relatives. He hopes those two people will be able to fill in the gaps and provide the truth when he interviews them this summer. More is known about Groff’s life as a crossing guard than his previous 49 years. The biggest mystery of all could be why he’s known as the General at all. Ring said some believe Groff grew up in London, England during the bombings and that’s where the name came from. Others say he received it during his time as a student, helping people line up before classes. “Other people think it’s just because he would wear a military helmet sometimes or because he would act like a general when he would direct traffic and direct kids,” Ring said. Discovering those answers is the most exciting part of the project, said Ring. “I don’t really know what the story is yet. In a way, it’s like I get to watch the movie over the course of a year and find out all these little details,” he said. Ring aims to begin shooting next month. The anticipated release date for Care For the Child: The Bridgeport General is spring 2017. To help Ring reach that goal, he has started an Indiegogo crowdfunding page. Ring has received money locally from The Waterloo Regional Hertiage Foundation and $9,000 from the Region of Waterloo Arts Fund. The money raised through the crowdfunding campaign, which expires on April 10, will help him improve the quality of the documentary and hire a professional to create an original score. “I do have enough funds to complete the film, so no matter what it’s going to be done and really right now it’s about how much can I put into it to make it better,” he said. The goal of the crowdfunding campaign is to raise about $10,000. There’s no doubt the project has local appeal. A Facebook page Ring started to promote it has 170 likes and people are chiming in with their own memories of the General. “We’ve had a lot of people contacting me with stories and most of them still live in the region, so it’s great,” he said. Ring also hopes his documentary can highlight just how important the General is to the region’s history, and that the Waterloo Region Hall of Fame will take notice. He’s planning to have the DVDs available at local libraries, so that Groff’s legacy isn’t limited to a portrait hanging in a Bridgeport School. To donate, go to www.indiegogo.com/projects/care-for-the-child-the-bridgeport-general#/. We’ve still got 30 days left to go with our Indiegogo fundraising campaign. Thank you SO MUCH to our supporters. Your contributions are going directly toward production costs, and will help elevate the quality of our end product. In April we are beginning our second phase of shooting. We will be doing some filming on location in Bridgeport, and are in the process of setting up interviews for the Spring and early Summer. Currently, we are anticipating a release in Spring 2017. Depending on how the next few months go, however, there is a possibility of having that postponed until Fall 2017. Ultimately, our goal is to tell this story as effectively as possible, and if we need those extra months in post-production we will take them. We are thrilled to announce that the film’s score is being composed by Ian Ring. Ian is a gifted composer and pianist, whose musical sensibilities will go a long way to helping set the tone of the film. We are also very pleased to announce that The MacQueens will be writing and recording an original song for the film. The MacQueens are a very talented duo whose music crosses multiple genres. For more information about Ian or the MacQueens, please visit the ‘production team’ page. Thank you again for your overwhelming support of this project. When we set out on this journey, we knew there would be interest, but we could not have imagined how many people were so passionate about The General, and having his legacy preserved for future generations. Frank Groff’s legacy has been recognized in many ways. There’s a city street and a playground named after him. Former Record reporter Frank Etherington wrote a children’s book based on his life that was later turned into a play. But almost 40 years have gone by since this remarkable local personality passed away, and his story has been fading out of public memory. His portrait still hangs in the front foyer of Bridgeport Public School, but the students who pass by it every day may not know why it’s there. The story, in a nutshell, goes something like this. In 1962, at the age of 49, Frank Groff made a hand-painted stop sign and, on his own initiative, began working as a crossing guard guiding schoolchildren through the busy intersection of Bridge and Lancaster. 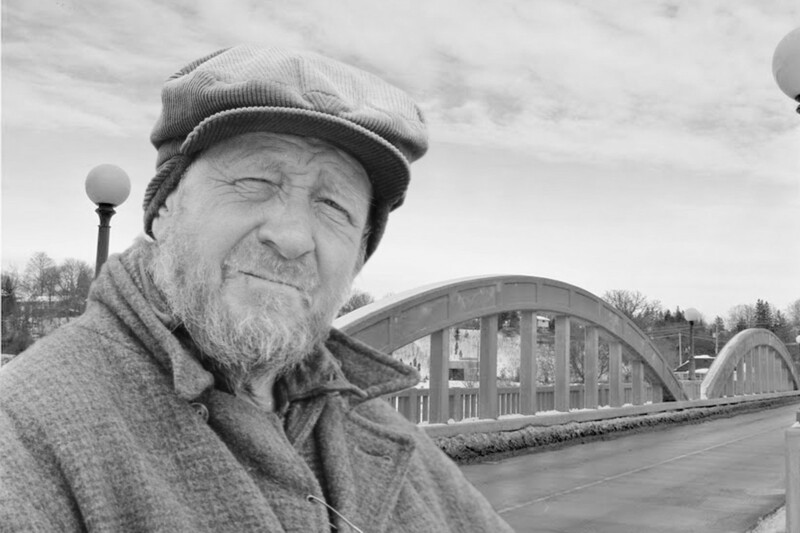 He was an eccentric who lived by himself in a ramshackle house and wore the same clothes every day — rubber boots, woolly hat, layers of sweaters, and a raincoat held together with safety pins. But he was loved and trusted, and became an integral part of life in the village. When all was said and done, Groff returned to his post and went on with what had become his life’s work, caring for the children of Bridgeport in his own way and on his own terms. Rob Ring didn’t grow up in Bridgeport, and these events took place before he was born. But he does have a personal connection that drew him to the subject: a portrait print of The General by artist Horst Maria Guilhauman, originally acquired by his father when he lived in the area as a student. The image has been part of Ring’s home environment for as long as he can remember. With a determined commitment from one of our region’s most accomplished video artists and modest funding support from both the Region of Waterloo Arts Fund and the Waterloo Regional Heritage Foundation, the project is off to a strong start. “Care For The Child: The Story of the Bridgeport General” remains a work in progress. We’ll have to wait until the spring of 2017, maybe longer, to see the end result. So this is early notice — so early that there are still opportunities to get involved and help make this project happen. To begin with, anyone interested can follow the production process as it unfolds through Facebook and a dedicated website (see link below), and help spread the word. There is also a campaign asking for support to help “bring the production value up to the level that this story deserves.” Contributions of all sizes are welcome, from pre-ordering a digital download ($10) or a DVD ($25) of the film, to becoming a fully credited producer (up to $5,000). Perks at the higher levels include signed and numbered limited-edition prints of that portrait of The General that inspired Rob Ring to begin this undertaking. For full details, go to bridgeportgeneral.com and follow the link. Martin de Groot writes about local arts and culture each Saturday. You can reach him by email at mdg131@gmail.com. We would like to thank the Waterloo Regional Heritage Foundation for their support of this film. The Foundation has contributed funding specifically earmarked for printing costs and DVD production. We are extremely grateful for this support. We are thrilled to announce that the Region of Waterloo Arts Fund has approved a grant to help support this film. Funding from the Arts Fund will cover a lot of expenses related to the production, including equipment rental and artistic fees. Thank you to the Region for their significant support! Today we are up in Eganville, Ontario, in the beautiful Ottawa Valley, preparing for the first interview for the film. We are visiting the studio of Horst Maria Guilhauman, the artist who produced the print that inspired me to begin this project. Growing up, there was a poster hanging on our basement wall. The poster pictured a man holding up a bright red stop sign, and there was some text delicately printed beside the figure. As a child, I never really took the time to read the text, nor to really give the image much thought… but it was always there. It was only once I became an adult, and my father gave the print to me, that I became fascinated with the man in the picture, who I would learn was Frank Groff. The journey of discovery that has morphed into this documentary began in 2008, when I made some inquiries amongst local historians about Frank Groff’s history. The more I learned, the more fascinated I became, and my hunger for more information grew. Now, 7 years later, I am finally officially beginning production on this documentary. I’m very excited to share this story with the public, and am anxious to learn more about the inspirational story of The General… a man who did things his own way, refused to conform, and who was loved & protected by his community.